MINNEAPOLIS— The Center for Biological Diversity will unveil a beautiful monarch butterfly mural at an event at Toni’s Market in south Minneapolis on Sunday. The monarch painting is the third mural in the Center's new endangered species mural project, which is placing murals in communities across the country to foster a stronger connection with local imperiled species. Photo by Collete Adkins-Giese, Center for Biological Diversity. Photos are available for media use. The Minneapolis mural celebrates these beloved butterflies, once-common backyard friends that have declined by more than 80 percent in the past 20 years due to herbicides and habitat loss. The Center and allies petitioned for Endangered Species Act protection for the monarch last year, and the species is currently under consideration for federal protection by the U.S. Fish and Wildlife Service. 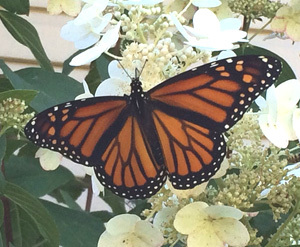 What: A public reception and unveiling of a monarch butterfly endangered species mural. When: Sunday, August 23, 2015 5 p.m.-7 p.m. Learn more about the Center's Endangered Species Mural Project and the amazing, migrating monarch butterfly.